Put on your dancing shoes and/or take off your shirt, there’s a new David McVicar production in town. 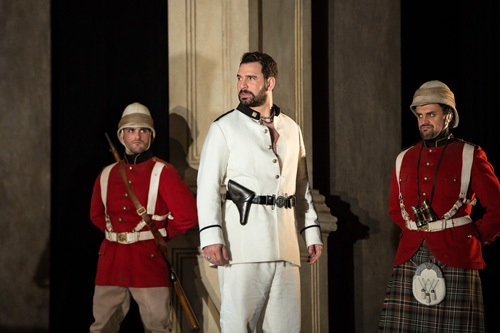 I use “new” advisedly, since this Giulio Cesare was first seen at Glyndebourne in 2005. But it’s still a clever and often delightful piece of work, and as Met Handel goes it’s pretty convincing. The cast is a little patchy, but it’s still a good time. 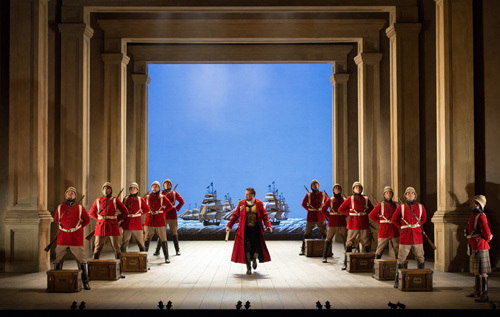 It seems tiresome to recount the details of this production, since it has already been out on DVD for so long and been seen in multiple opera houses, so I’ll be brief: it casts Caesar’s Romans as late-nineteenth century British imperialists and the Egyptians as Indians. The set shows traces of eighteenth-century design (including an old school wave machine) and also the more recent phenomenon of Bollywood. It sets up the characters well–Sesto and Cornelia are identified by their very British looks as Romans, something that some productions don’t make very clear–and it’s pretty entertaining, though rarely asks to be taken seriously or complicate this political construction any further than I’ve already explained it. You can take a more serious approach and have it work (for example I like this Francisco Negrin production), but the comic tone is fine with me too, it fits the artifice of the genre. 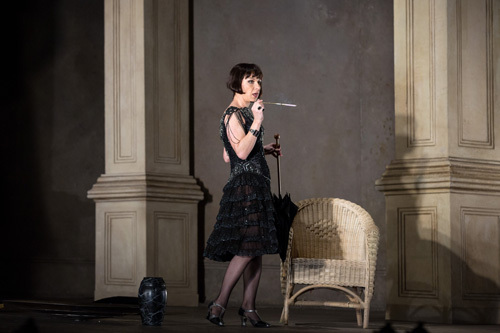 Natalie Dessay was in far better voice for this performance than she was at last year’s Traviata, but I still don’t think this is quite her role or her production. Her voice sounds flimsy, with very little core or bite, and while she can act cutesy in a gamine sort of way, this production was intended for a Cleopatra far brasher and brassier and, well, Danielle DeNiese isn’t a great singer but she sold this production on the DVD. Dessay does it all OK but doesn’t own it in the same way. 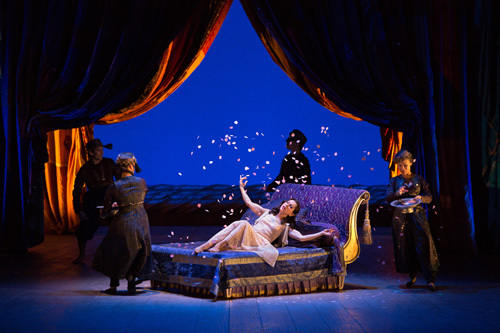 When Cleo became down on her luck partway through Act 2, however, Dessay seemed to come to life, suddenly becoming a much more interesting actress and singing a spectacular “Se pièta” that was actually very moving. I’m sorry to say that David Daniels also is sounding rather worse than he did in earlier years, though he is an excellent musician and sometimes things clicked. 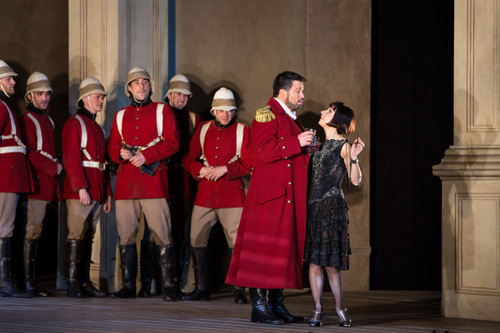 His Cesare was effectively acted if not particularly charismatic or insightful, and sang unevenly. “Presto omai” was kind of hollow and hooting, as was some of “Va tacito” “Se in fiorito ameno prato” (in which David Chan was an absolutely superb violin soloist). The fast arias like “Quel torrente” went very, very fast, where Daniels’s coloratura still works well but he lost some volume and sometimes needs extra breaths. He also has a way of swaying back and forth when singing coloratura that made me want Peter Sellars to swoop in and give him a finicky prop to manipulate while singing. The vocal star of the evening, as far as I’m concerned, was Alice Coote as Sesto, whose viola-toned mezzo sounded firm and solid throughout, including a beautifully spun-out, quite slow “Cara speme.” Sesto might not be a character who gets a lot of theatrical variety, but she did the shell-shocked thing well. 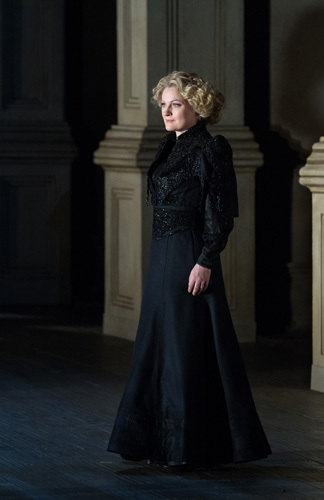 As Sesto’s mother Cornelia, Patricia Bardon had a unique, vinegary sort of tone that doesn’t appeal to me very much, but it is unique. 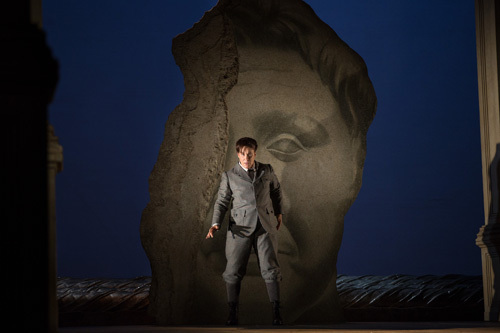 As Tolomeo, countertenor Christophe Dumaux had a more beautiful tone and more variety than Daniels, including some impressive high notes in “L’empio, sleale.” He also managed some impressive feats of athleticism that vaguely made me wonder if countertenors at French music schools need to often defend their machismo. Harry Bicket seems to be the Met’s Handel conductor of choice, and you can see why: he makes it still sound like Handel, but also manages to fill up the house to a reasonable degree. It’s not terribly inventive leadership but he does a very tricky job smoothly. It’s also great to hear the theorbo/lute/guitar in the pit (Dan Swenberg, who also played Eliogabalo). The supporting characters I can’t be too enthusiastic about: Rachid Ben Abdeslam sounded almost voiceless and mugged as Nireno in a fey characterization that McVicar and he should have thrown out long before 2005. Guido Loconsolo was a unagile and growly Achilla, but may just have been miscast. It’s a shame that the Met couldn’t put on a fresher production, but it’s nice to finally see some more spirited work from McVicar here, vintage or not. Baroque lovers should be relatively satisfied (probably close to as much as we can expect of Handel performed by a company unsuited to it in many ways), and this production is fun enough that it might even make some new ones. Who will hopefully write the Met demanding new productions of Ariodante or something. Well, maybe not, and if they did I doubt anyone would listen, but a girl can dream. Was curious where you were sitting. I had a rush seat that was fairly close to the center so I saw everything. I was thinking if you were off to the side or in the Balcony or FC (where I usually sit) you would be missing a lot. I felt I was watching theater within a theater within another theater. 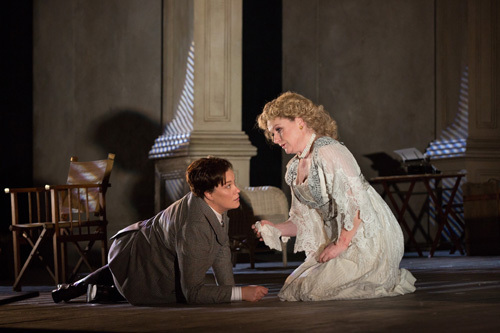 The Met did Rodelinda for Flemming, why not Ariodante (which I love) for JDD? Anon: I had a great set near the front center of the Dress Circle. I wondered about sight lines from the sides as well, particularly with this deep a set. bgn: oof, you're right, I meant "Se in fiorito ameno prato." The horns in "Va facito" mostly sound good but a few of the high notes were a little tough.